Discover Ouarzazate, known as the gateway to the Sahara Desert, on this all-day trip from Marrakech. 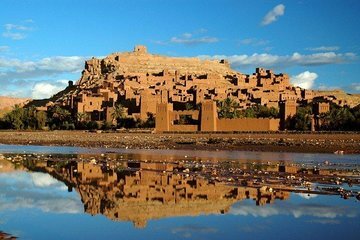 Head out to the Atlas Mountains, stopping at the Ait Ben Haddou kasbah and ancient salt mine along the way, before reaching Ouarzazate, where the southern foothills of the High Atlas Mountains meet the desert. There, visit the famed Taourirt Kasbah (a 19th-century palace) and learn why the city is a popular shooting location for films such as Gladiator.